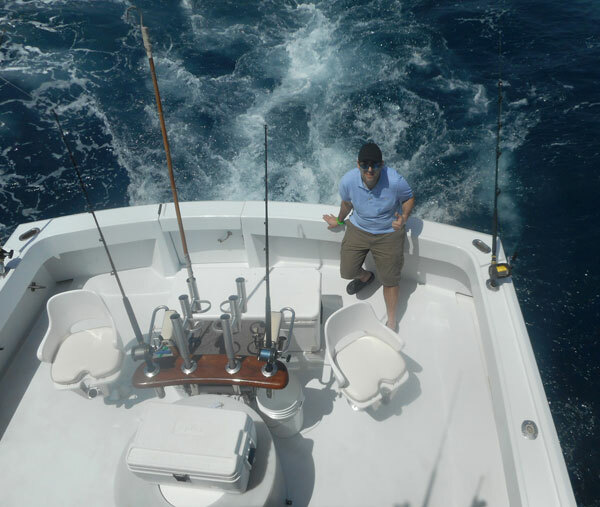 Sport fishing addictions vary between different anglers. Target species, locations, methods, and of course size and numbers, are what drive the people that enjoy our favorite pastime. Those of you that know me can attest to my passion for big game fishing, more than most. Having fished freshwater species most of my life, I've been lucky enough to catch almost every species on my bucket list. 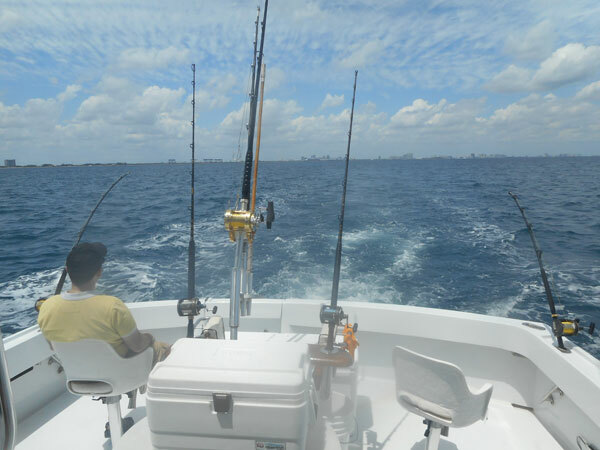 Saltwater fishing is an entirely different ballgame. 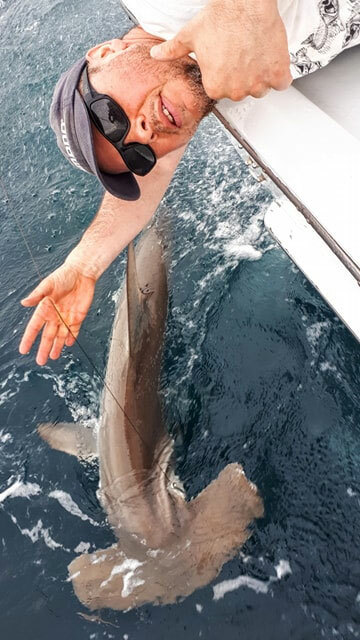 Countless big game opportunities around the planet exist of many various of ocean dwelling monsters, but few can rival the thrill of battling with big sharks. Being one of the Apex predators, they inspire fear into swimmers and surfers, and awe to their admirers. Even more so to those that are fortunate enough to target and battle them on rod and reel. 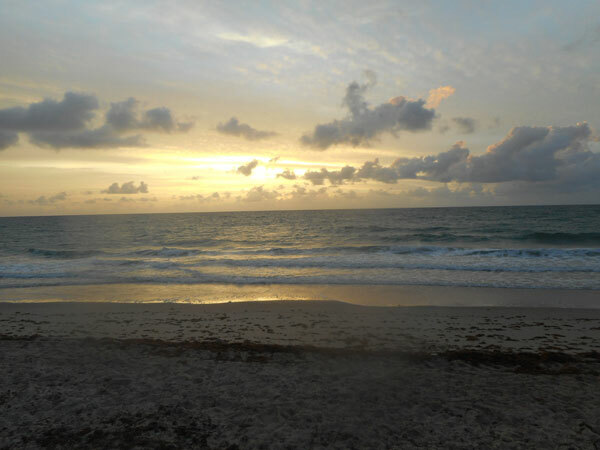 As my daughter recently got married and moved to Florida, I decided to cap of our endless winter by going to visit her. As she only gets off work in the evening, I invited my friends Mike and Yohann to join me on my latest big game shark fishing adventure. 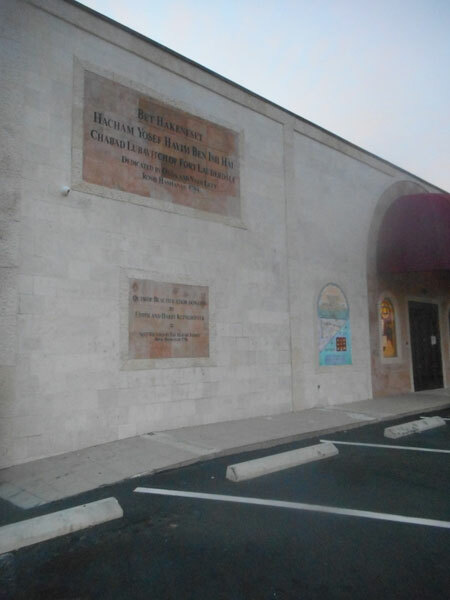 After arriving at the Bed and Breakfast house in Pompano Beach on Sunday night, I headed off for morning prayers and Chabad of Fort Lauderdale, as I'm currently reciting daily service prayers for my late father. Very convenient to have Chabad synagogues around the globe. 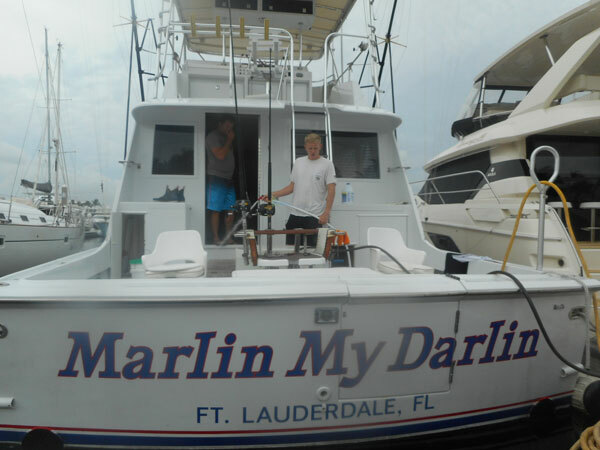 After a late breakfast at a local eatery nearby, we headed to the Bahai Mar marina in Fort Lauderdale to meet up with our charter service, Marlin My Darlin. Plan was for them to put us onto some big hammerhead sharks that migrate South every April and May. 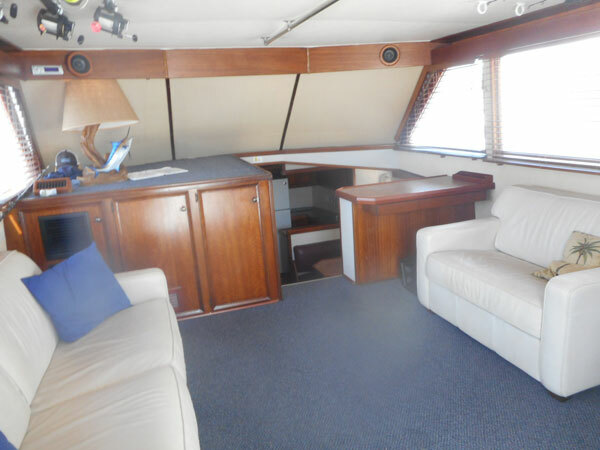 We got to the marina, to find a very nice 53 foot yacht, complete with lounge, kitchen, bedroom, toilet and shower. Equipped with twin Cummins engines that generate a good 1500 HP, ell the latest electronics, outriggers, and heavy duty gear + tackle, I got the feeling that we were going to have a blast over the next 3 days of big game sport fishing with them. Nice to have air conditioned lounge on board. I preferred the breeze on the captain's deck, which also made for interesting conversations with both the captain and first mate. First order of the day, is catching bait. Oily and strong smelling bonitas seems to be a favorite out there, so we set up 5 rods to troll at a good 5-8 miles per hour, in hopes of crossing some big schools of these pelagic fish. After catching some more bait, the crew switched up the gear and got the big rods on deck. JJ split the bonitas in half. He then proceeded to rig them onto to some of the biggest and baddest of rods and reel combos I've used. 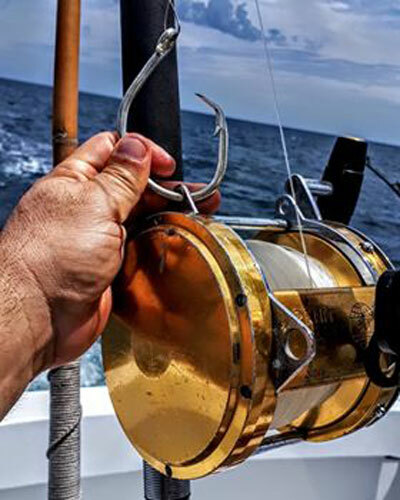 Once rigged, the bait is let out on flat line behind the boat, tipped with balloons which both help keep the bait on top, and also act as strike indicators. Another rod is fitted with a big sinker and fish mid column, anywhere from 200 to 300 feet deep. 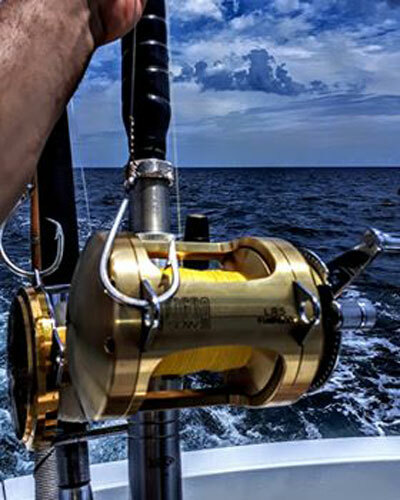 The beauty of fishing this region of Florida, is that the gulf stream is only a couple miles from shore, a few minutes boat ride from the marina. 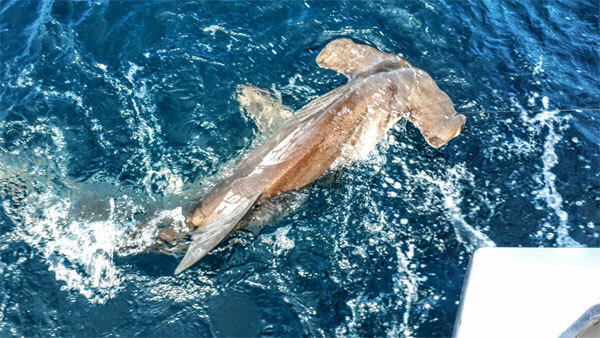 Every spring, big hammerhead sharks make their way down the Florida coast on their way to spawning ground in Mexico. The boat is set up in or near the current, which flows Northward. It is then held in place by thrusting the engines to keep it stationary. This creates a bloody chum slick wafting North, right into the ultra sensitive noses of the big hammerhead heading South. As they follow the scent trail, they eventually find the fresh cut bait waiting for them. 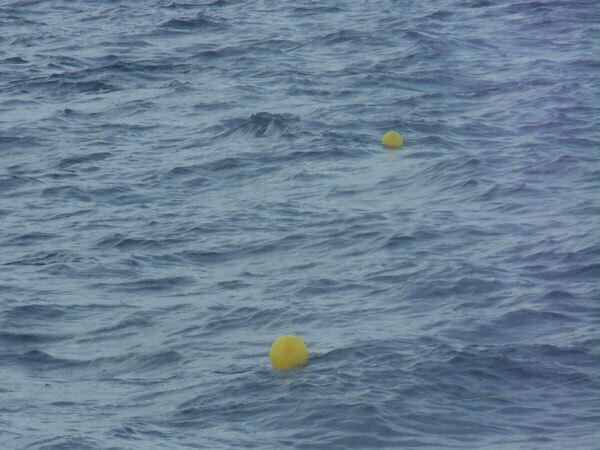 It tooks a while, but as I was up on the upper deck chatting with Captain Matt, one of the balloons disappeared, and the the reel went off screaming, while our first hammerhead shark peeled line off at lighting speed. 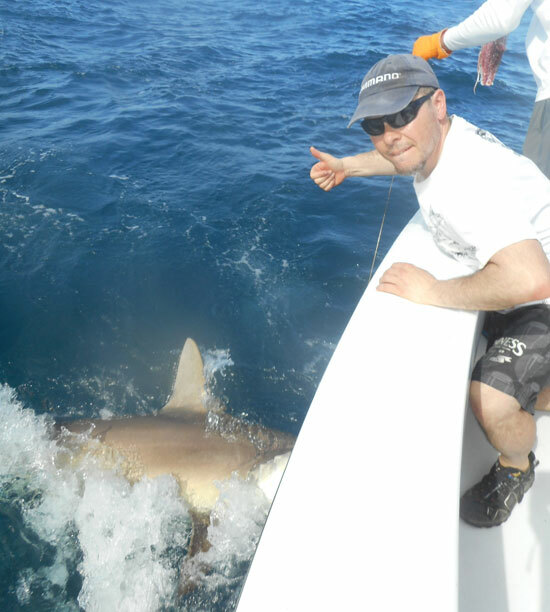 Our plan was to take turns fighting the big shark until we tired it enough to get some boatside pics before releasing it, as Florida forbids keeping that Hammerhead sharks, as well as even bringing them on board. I can't begin to explain the power these beast have, the video at the bottom of this post, may give you a rough idea. Here are some nice pics we shot in between taking turns fighting the fish and shooting video clips. 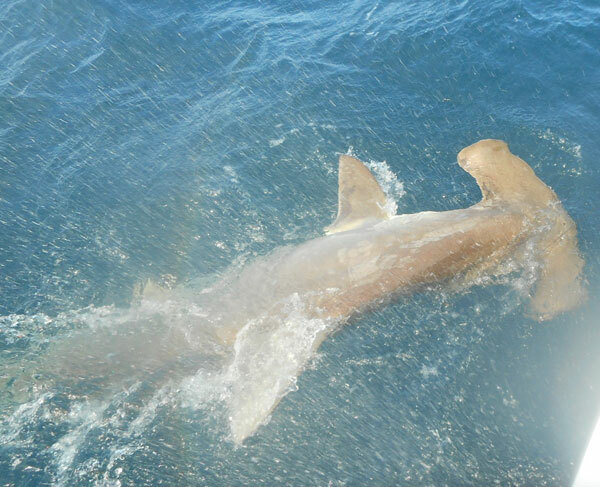 Our first hammerhead shark of the trip was about 9 feet long, somewhere in the 250 to 300 lbs range. Was brave enough to get up close and get this pic of this strange yet magnificent beast's head. Notice the huge girth on this big shark. They aren't referred to as "T-heads" for nothing, and those big sickle like dorsal fins are quite impressive as well. 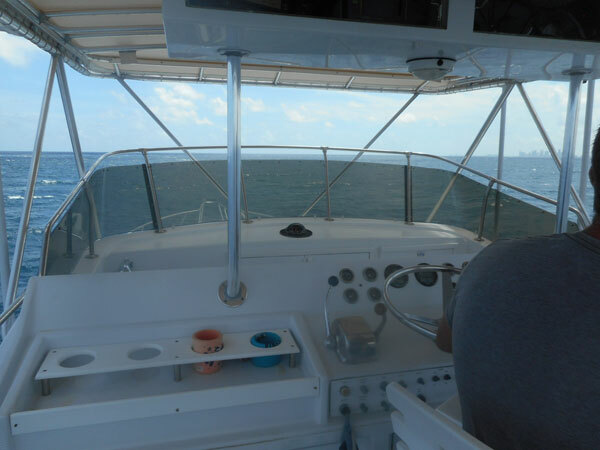 And of course mandatory pics of all of us, as we each taking 2 turns at fighting the big hammerhead shark to get it tired enough at boat side. 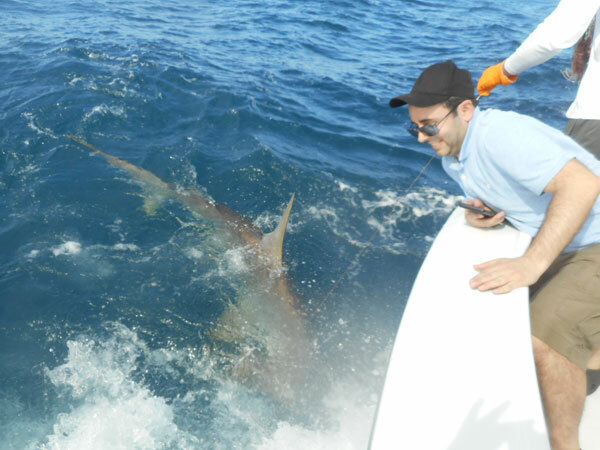 JJ did a great job handling the big shark boatside, long enough for us to get the shots an footage. He then proceeded to grab the T head and make sure is was well revived before releasing it. Having landed a nice specimen of our target species, the mood on the boat turned was more relaxed. We had come a long way and spent a good deal of hard earned cash on our trip. Personally, I enjoy soaking big baits waiting for a monster hit. Mike and Yohann we both on board with me, but I did get a feeling that both the captain and mate were a bit unsure if we could handle possibly not getting any bites. 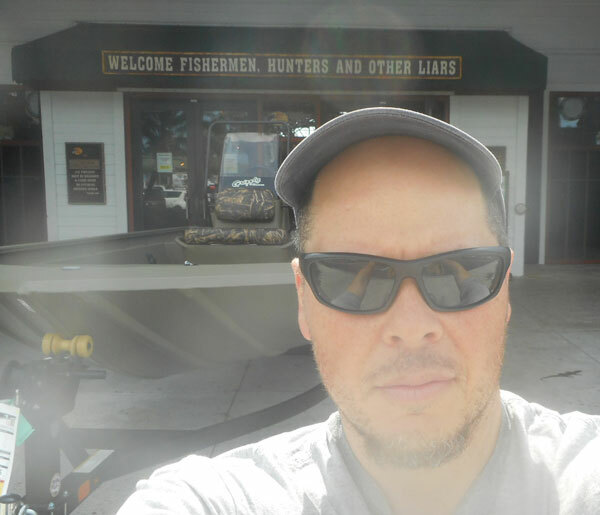 Once our first catch was out of the way, I reassured them that we had known what we were in for, and that we were OK with doing the same for the following couple days. Didn't get any more hits, except for a tiny shark that was hooked on the deeper line. We didn't know it was even there, until we pulled in the lines at days' end before heading back to the marina. The following day, forecast of for wind, rain, and chance of heavy storms all afternoon. We agreed to get a head start on our outing around mid morning. I was up bright and early as always, and got a nice pic of the sunrise before the clouds moved in. Unlike the first day, the trolling bite was very good. 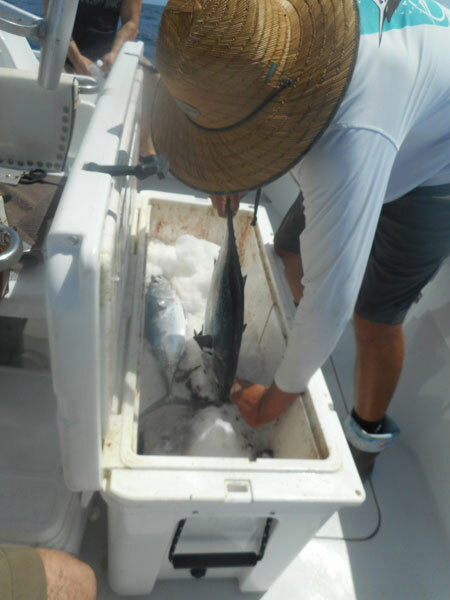 We caught our bonitas as bait in no time, and hit some other pelagic species we kept for the table as well. 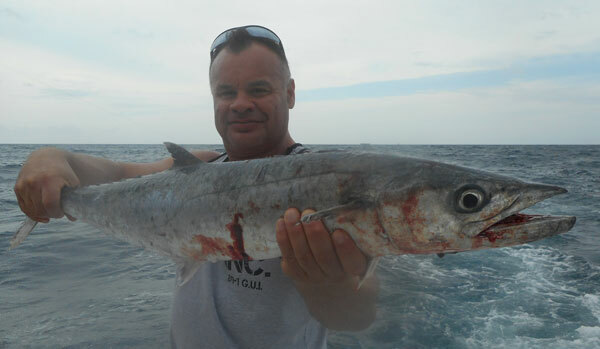 Mike landed a nice kingfish. Shortly after, all 5 lines got hit, with 4 of them getting cut off within seconds. 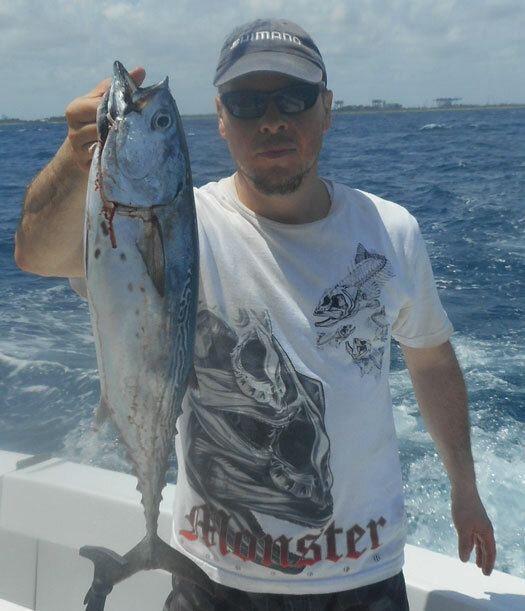 Yohann was lucky enough to land one of the 5 wahoos, a tasty species with razor sharp teeth. 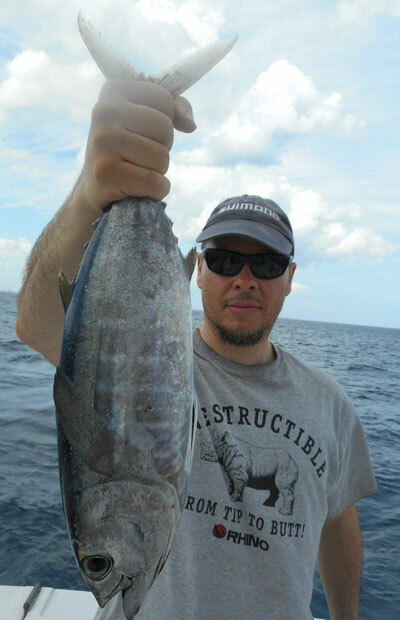 He capped of our trolling session with his first blackfin tuna, one of the most delicious species in the region. Cameron got the first balloon line for sharks into the water, and before it even got to the desired distance, it was grabbed by a hungry hammerhead within less than 15 seconds. 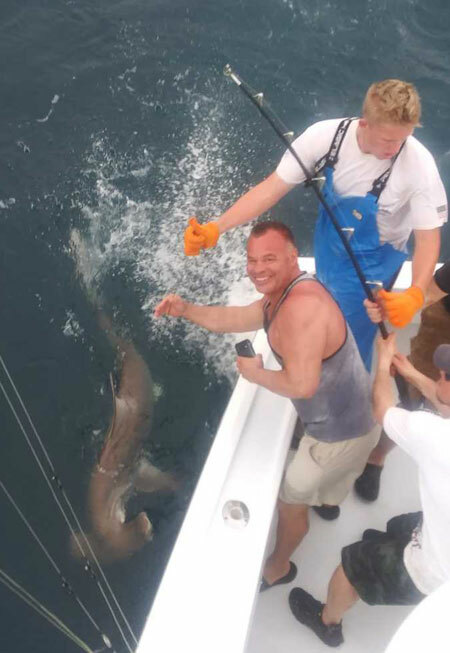 We each got one turn fighting it, and landed the smallest shark of the trip, probably about 7.5 feet long, under 200 lbs. Matt shot a nice pic for us from the Captain's deck. While our hopes were high, the rest of the day was silent. Just as well, we stayed in the lounge thought the rain. 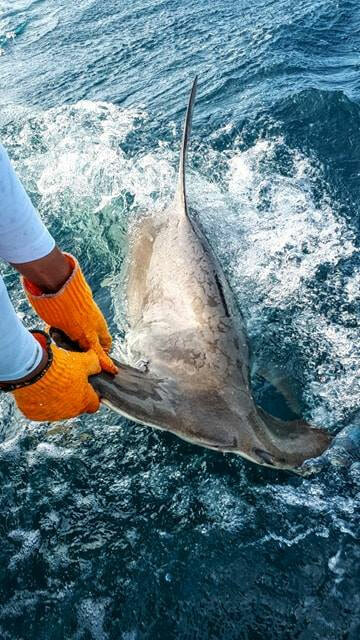 The following day was our last chance at possibly landing multiple of bigger hammerhead over 10 feet, which is about as big a most of the mograting shark re in that region. 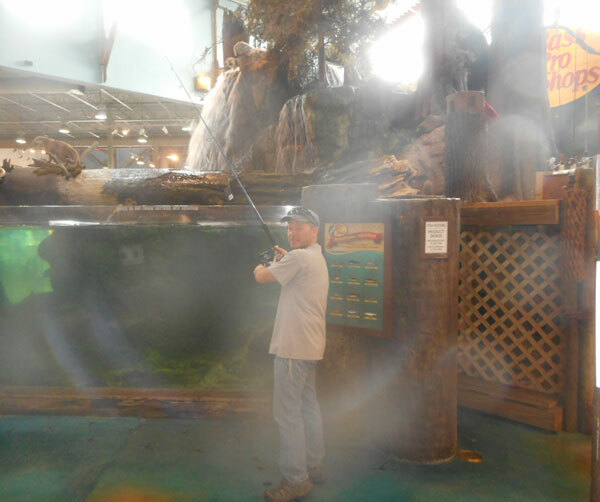 After a nice breakfast, we stopped at Basspro shops to check out their fish tank. With some monster bass in the 12-15 lbs range, and giant redfish, yours truly couldn't resist goofing around. Back to fishing for bait. After catching enough bonitas for bait, we helped JJ pull in the lines. Luckily, I was about to get the last line out when another tasty blackfin came to play. Made for a very tasty breakfast for Mike and I the following morning. Or new captain for the day was Tom, the senior Captain in the fleet, with over 40 years of experience. After a report of seeing Hammerheads cruising at the surface over 400 feet, he knew exactly where to setup shop. To make a long story short, we hit the more hammerheads that afternoon. 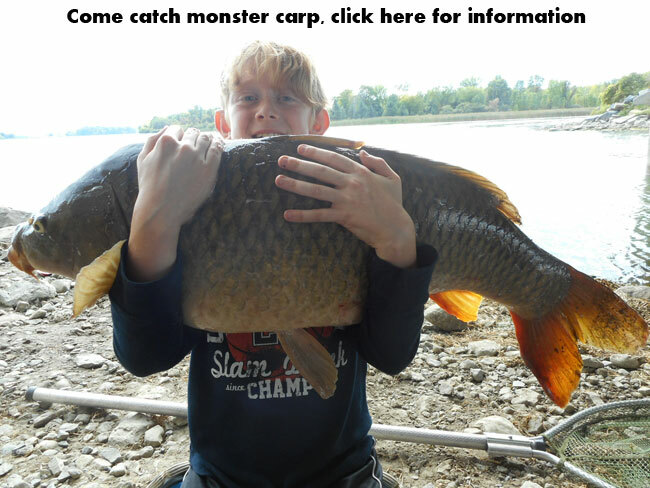 The first one was the biggest, a monster pushing 11 feet / 350 lbs. I fought it hard for 15 minutes before passing Yohann the ord for a chance. Unfortunately, we must have been tail or fin wrapped above the leaders, and it managed to chafe and break the 100 lbs test mono line shortly after. Next fish was Mike's turn. He fought it hard on the only reel spool with heavy braid, while Yohann waited for his chance to help once Mike tired. For the first time, I Enjoyed just relaxing and wathcing the fight from the top deck in the breeze, having a much better view and idea of what was going on. 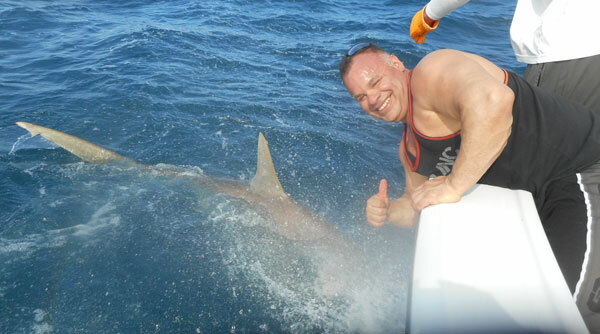 Mike finally got that shark next to the boat, but when it turn and ran, the line snapped and the big shark was gone. With only half hour left to the outing, we figured that was all, but we were surprised when a third hammerhead hit within a couple minutes. This time, Yohann to the line, but he was gassed within minutes. 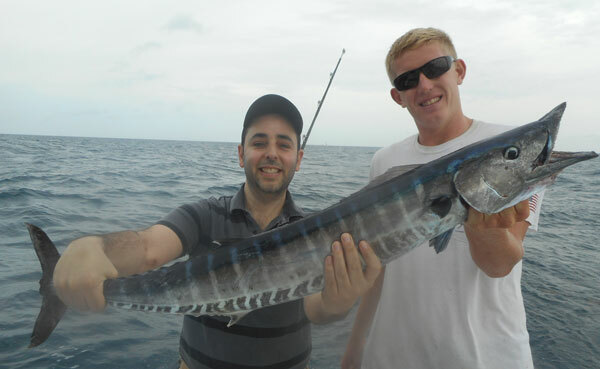 This fish just kept pulling downwards, I think Yohann's inexperience caused him to tire too quickly. 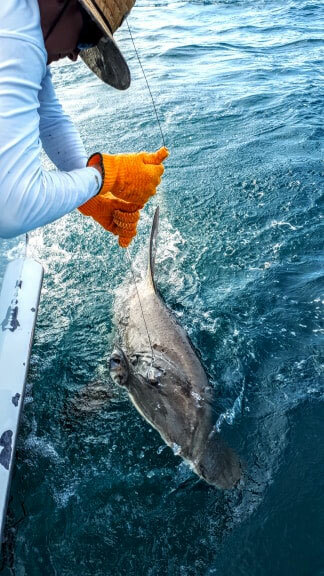 He handed me the rod, and while fighting the shark, I pointed out what I was doing as far as technique, which trumps raw power any time you are fishing for big, powerful game fish. I fought the shark all the way to the boat, but before Mike had a chance, the fight was over when JJ grabbed the leaders. 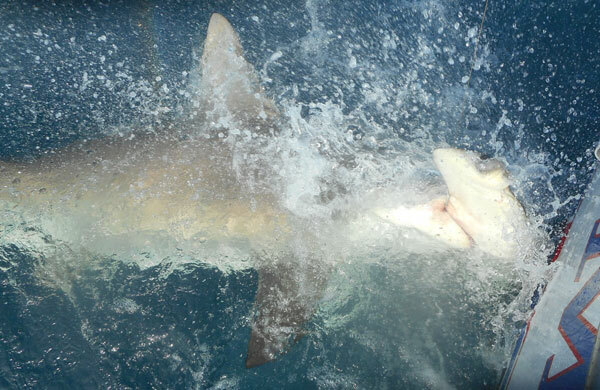 Unfortunately, the 8 foot hammerhead spit the hook just as we were getting set to get some pictures. 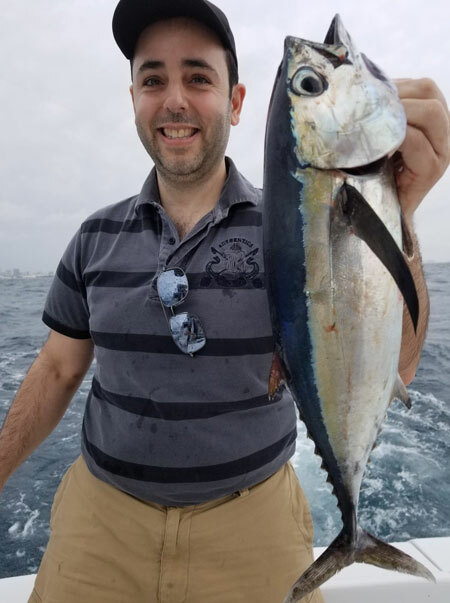 By far our most productive day, I just took the time to soak in what was likely the best sportfishing trip of my life, in over 40 years since I've started fishing. 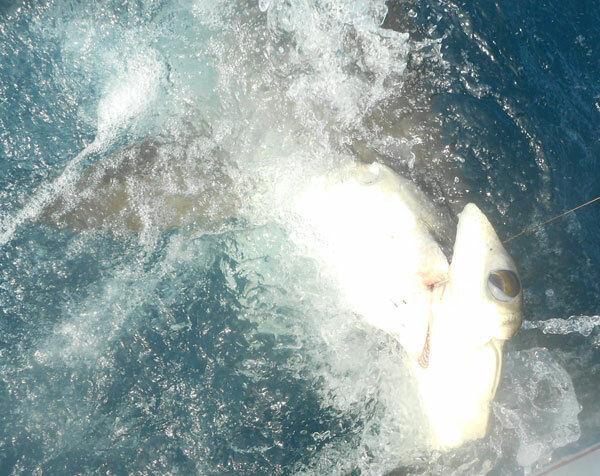 The following vide will yield a slight idea of the excitement we had on board, as well as the raw power these sharks can generate during a brutal fight. 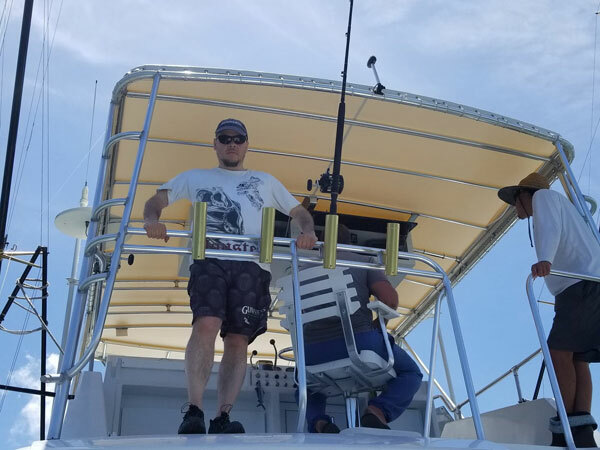 Again, I have to thank the wonderful crew members of Marlin my Darlin sport fishing charters, Captain Matt and Tom, and mates JJ and Cameron. 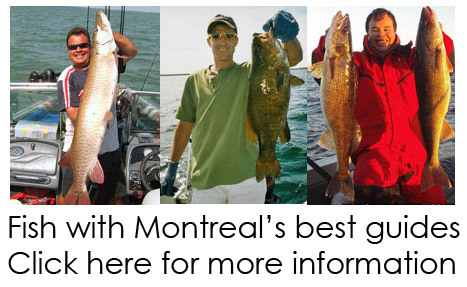 Having fished with many guides across the continent over the years, they rank at the top of the game. Their seamless coordination, matched with their knowledge is second to none. 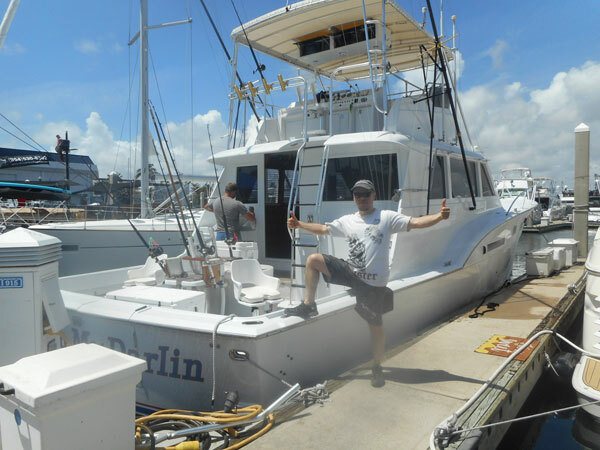 As for the impressive boat, impressive gear and friendly service, I'd like to thank Rick, owner of Marlin My Darlin charters. 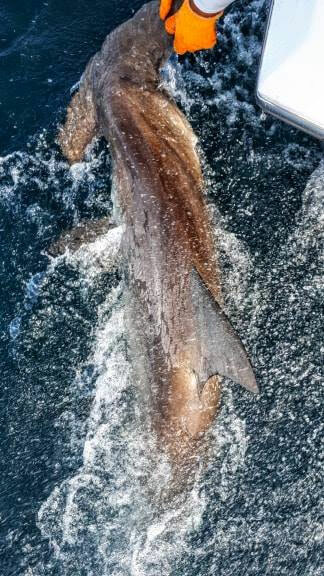 Also would like to thank my friends Mike and Yohann for joining this memorable trip, splitting the costs and helping to land these powerful and magnificent beasts the good Lord has put in our oceans. Having battled with them has added appreciation of His creations, and the true thanks and glory are all his.